When a technology such as the Web is first introduced, the primary concern is making sure that the technology works. As we become more experienced with designing web sites, the problem no longer remains the technical infrastructure but rather becomes how we can make a web site that is easy to use and meets the needs of the user. As a result, many web sites are being designed utilizing a user-centered development process. User-Centered Web Development guides readers through the process of designing user-centered resources that are based on feeback from the end user. 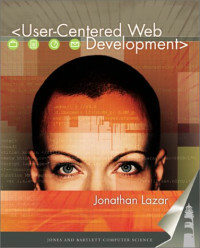 User-Centered Web Development will take the reader through the entire development process: From the initial idea of developing a web site, to determining the mission of the web site, collecting the requirements, designing the pages, performing usability tests, and eventually implementing and managing a web site. In-depth analysis of the user-centered web development process. Discussions of requirements gathering, usability testing, and maintenance and evaluation. Case studies highligh user-centered design for web sites in three different settings: a school, a nonprofit organization, and a for-profit company. Devotes separate chapters to the essential topics of navigation design, page design, and design for multiple browsers. Dr. Jonathan Lazar is an Assistant Professor in the Department of Computer and Information Sciences, and an Affiliate Professor in the Center for Applied Information Technology, both in the College of Science andMathematics at Towson University. Dr. Lazar earned his Ph.D. in Information Systems at the University of Maryland. Dr. Lazar has a number of research publications focusing on human-computer interaction issues in the Internet environment. Specifically, he is interested in user error, user training, user-centered design methods, electronic surveys, and web usability. Dr. Lazar regularly teaches courses in Web Design, Human-Computer Interaction, and Systems Analysis and Design. He has also taught courses in Management Information Systems, Online Communities, and Database Management. Dr. Lazar is interested in integrating community service with courses and research in Information Systems. Dr. Lazar was named the Towson University Faculty Advisor of the Year in May, 2000.